Owens River Road offers dozens of dispersed camping areas within Inyo National Forest. Located right off US-395, about 6 miles north of Mammoth Lakes, and about 6 miles south of June Lake Loop, this area is free for RV camping with a generous 28-day camping limit. Owens River Road itself is paved but bumpy, yet there are dozens of dirt roads leading from it and stretching for miles deep into the woods. 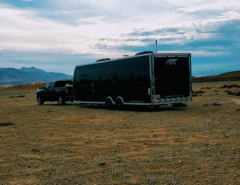 Each dirt road appears to be just wide enough to accommodate a standard 8.5 foot wide trailer, and roads feel hard packed with a light sprinkling of gravel. 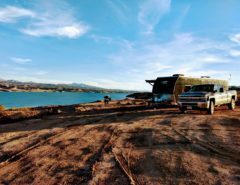 You might experience some branches brushing against the side of your truck and trailer, but if you’re accustomed to scratches on your precious-paint job, and accept it as just a circumstance of boondocking, you’ll still live. You’ll definitely want to look up this place on Google Maps using satellite view just so you can identify potential campsites and find out where there’s a wide enough place to turn around. Some of these roads don’t offer any turn-around spots. You may also notice other areas off US-395 that appear to offer campsites, and most of those are also available for dispersed camping. Our campsite was located at 37.740602, -118.964448.Verizon 4G coverage at this location came in at 2 bars unboosted, and 3-4 bars with our WeBoost. We were able to connect to the Internet using our hotspots and get our webdev and social media work done. Best of all, Sash and I experienced a lot of peace and quiet here. We did see other RVers a few hundred feet away through the trees, but we never heard from them. We even spotted a few deer in the distance. There’s plenty of firewood to gather from the ground, and the night skies are rich with stars, even the Milky Way galaxy is easily visible. 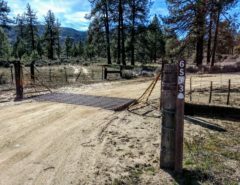 If you were to continue along Owens River Road for a couple of miles you’ll reach Big Springs Campground, a developed USFS campground (fee based). When we were not working, we hiked up Obsidian Dome, located just a few miles away, and explored Mono Lake’s “South Tufa Shore” and took plenty of photos. We also built a campfire on a couple of nights and grilled some steaks. Note at this time, campfires are restricted to metal containers, and you must obtain a fire permit, which you can download here. Amenities are about 6 miles south in Mammoth Lakes, with grocery stores, drug stores, auto parts, laundromats and restaurants.